Next in the series of Egg Substitutes I decided to make a cake with Fruit Purees. while I have already made a Banana Cake, Banana Muffin, some cakes with apple puree etc, I still wanted to make a different version, even though the ingredients might be similar. One recipe that I already have is one with Flax Seed and Banana. I was planning on making more of chocolate based cakes with egg substitutes hoping that will serve dual purpose. However with some bananas going over ripe, I had to take a call. 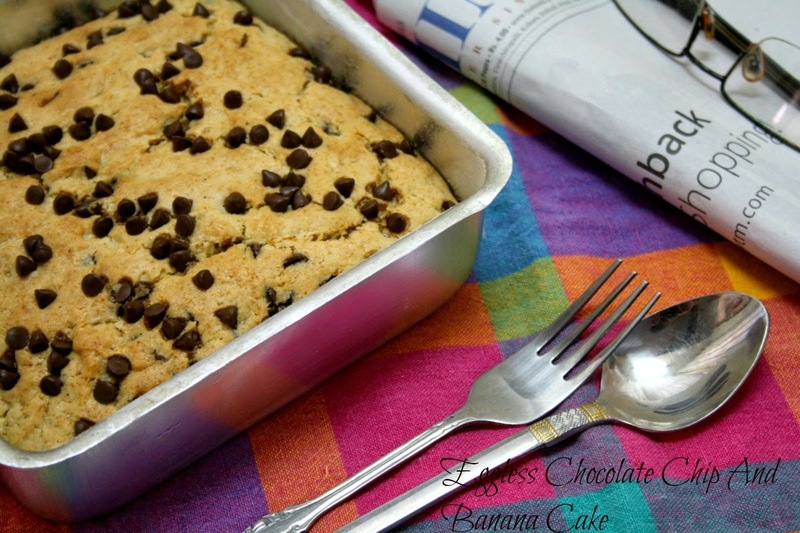 I could've done a chocolate loaf with banana. Well one realizes that brilliant ideas come late. So I had this cake in the oven yesterday morning when the cooking for the day was less. 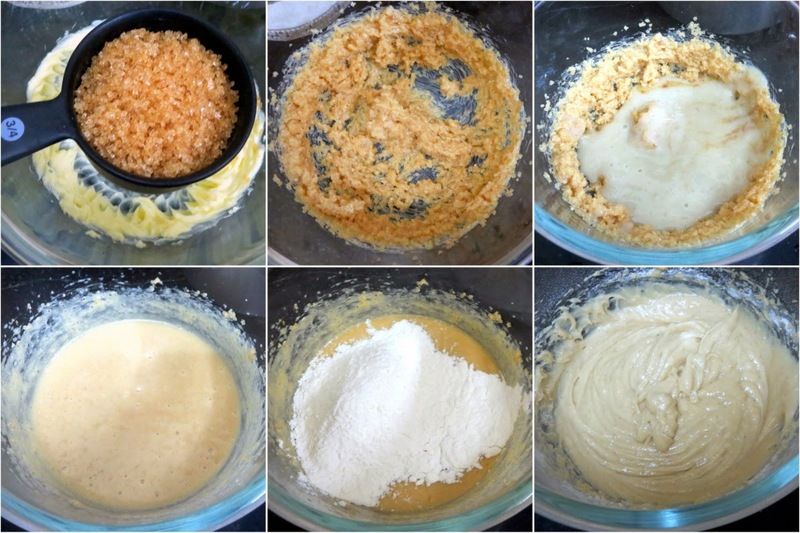 I had this bookmarked and since the ingredients were similar to what I had previous used, I wanted to bake it with Cake flour. Cake flour can be easily prepared at home by mixing in 2 tbsp Corn starch with all purpose flour and sifting it couple of times. I know the all purpose flour that we get here will be very different from what's available elsewhere, I still wanted to try it. As I understand when we use fruit based replacement, the nature of the liquid being different would require low temperature and longer baking time, for the cake to get a good body. With Aerated or leavening agents, the rise happens quick. Or rather if the temperature is low, as the leavening agents rise up quicker than the flour gets cooked, the blocks break and that's when you have the sink in middle. 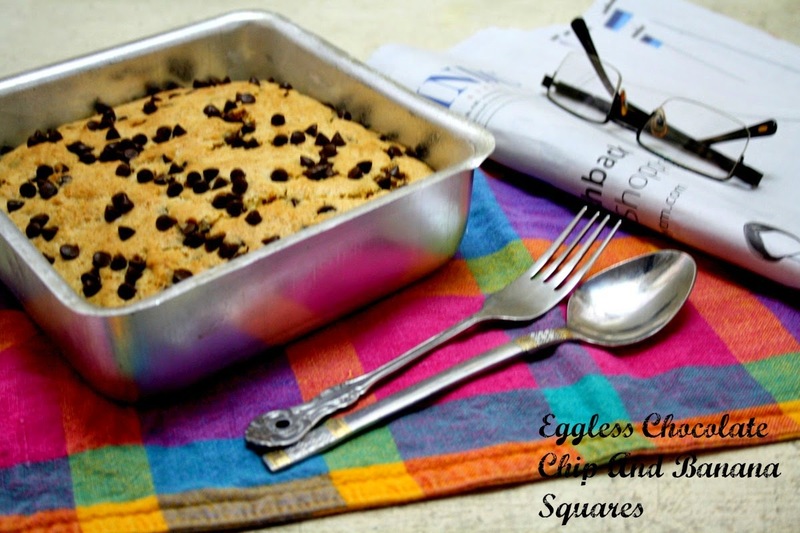 So for cakes with leavening agents and egg, the temperature can be high and shorter baking time. The cake will get cooked fast and since the binding egg is present the protein blocks won't fall down. On the other hand, as there is no binding agent in this cake, the banana puree has to work both as binder and moisture. Corn flour will also help in giving some volume to the cake. However one should bake it further to make it dry and not sticky after it cools down. All fruit based cakes should rest for a while before being served. Especially for the bakes with banana, sitting in the fridge for a week, actually improves the texture and flovour so much. I have experimented this and know it tastes so delicious! Of course one will not accept it. However if you have the habit of baking and forgetting about it, then it's most desired outcome. 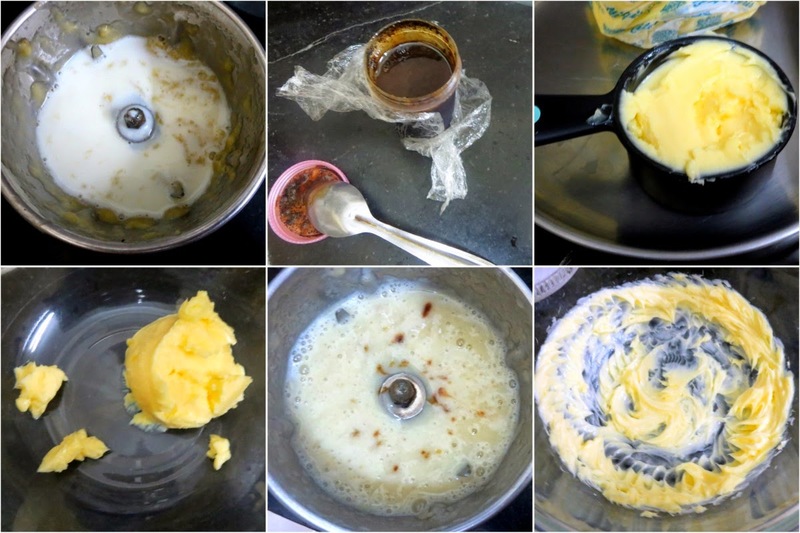 In a mixing bowl, take the butter and beat till creamy with a hand mixer, add the brown sugar and continue beating till well mixed. 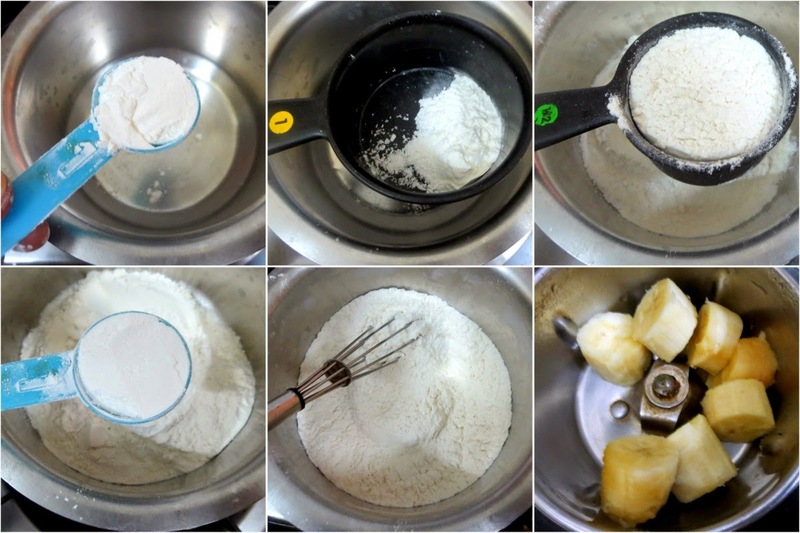 Make a puree of the banana with milk till you get a smooth liquid. Add this to the sugar mix. Continue mixing till well incorporated. To make cake flour, add 2 tbsp of corn flour/starch to the measuring cup, fill it with all purpose flour over it. Sift couple of times and you have the cake flour. Next add this cake flour to the mixing bowl and continue on medium speed. Add another tsp of milk to get the right consistency. Grease a 8" inch square pan and bake at 170 C for 35 Mins. Check if its done by inserting a knife. Cool it for 10 mins and slice as squares. I baked this just before leaving to work and was really in a hurry. My brain didn't seem to work on how to do the setup. I saw Hubby Dear reading the paper and decided to use the newspaper along with the specs. I was surprised that I ended up with a similar setup! And yes final update is that even my boys loved this cake, including Chinnu and its over in a days time. I couldn't click a individual picture of the square as Athamma was enthusiastic in her slicing.